In a coup for open water swimmers in Western Australia, Vorgee has this week signed a new three-year partnership with Swimming WA. “We are very excited about this meaningful and positive partnership, and look forward to working closely with the WA swimming community,” said John Vorgias, Vorgee Managing Director. 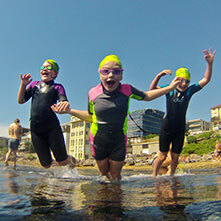 Darren Beazley, CEO of Swimming WA said Swimming WA was thrilled to be working together with Vorgee, “Vorgee [is] one of Australia’s leading and most preferred aquatic brands. Through this partnership, we will be able to provide our 85 Member Clubs across WA with specialist swimwear and swim products, as well as provide the WA State swimming teams with high-quality swimwear for the next 3 years. Swimming WA has recently released the 2018-19 event schedule of the popular Open Water Swimming Series, with 12 rounds in metro and regional locations and distances of 500m to 10km. News and opinion snippets from the world of ocean and open water swimming, water safety and related topics. Noosa duo Kareena Lee and Nick Sloman add silver and bronze medals respectively in the 10km open water marathon at Pan Pacs today.